The Flax Trust is one of the largest and longest established development trusts in Ireland. It is a registered charity formed in Belfast in 1977. For over 35 years it has been committed to the “reconciliation of a divided community through economic and social development, bringing peace to both communities, one person and one job at a time”. 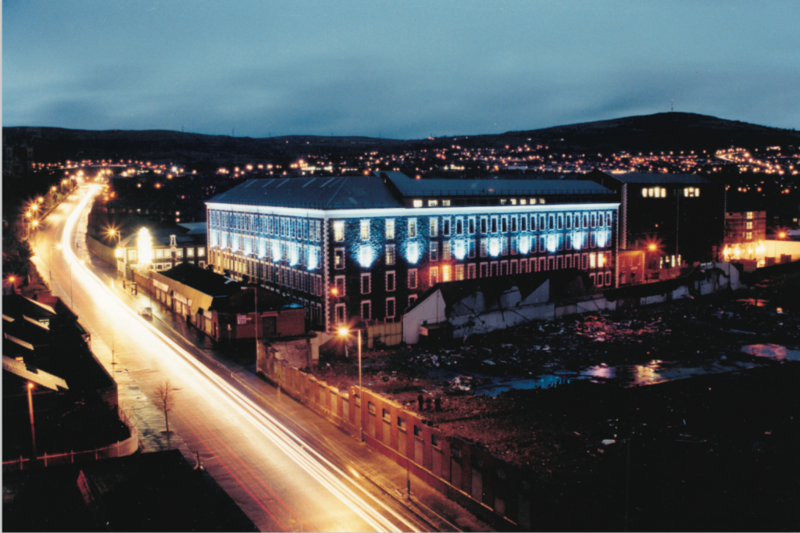 Flax Housing Association Ltd was set up in the 1980’s to address the acute shortage of social housing and sheltered accommodation in the North Belfast area. in 1992/3 set up Ulster Community Conference an association of community based economic development organizations to support and foster community economic enterprise. The broad aims being to co-ordinate the community economic development sector; share resources and good practice; help members realize their full potential through the establishment of Ulster Community Investment Trust Ltd.
in 1995 initiated the creation of Ulster Community Investment Trust Ltd, in recognition that with decreasing grant support, the future of community economic regeneration depended on access to alternative sources of funding. UCIT was established as a provider of affordable loans and free business support and mentoring for the social economy sector. Since commencing operations in 2001, UCIT has committed in excess of £50 million to over 360 charities, community organisations and social enterprises in Northern Ireland and the Republic of Ireland, contribution to the sustainable economic and social welfare of their local communities. Initiated the School for Social Enterprises in Ireland, set up in 2003 in partnership with Ulster University in response to the need for high quality education, training and development for the growing social economy sector. The highly successful Best Practice visit in 2010 to Fordham University, New York by a group of SSEI Graduates and a reciprocal visit of a delegation from Fordham University in 2013 was organized through Flax Trust/America. SSEI continues to roll out a series of high profile Master Classes presenting opportunities and best practice illustrations to social enterprise leaders and managers. SSEI plays a major role in professionalizing the social economic sector. Flax Trust Classics initiated in 2012 provides Bursary Awards to Queen’s University for young classical musicians – singers and instrumentalists and Bursary Awards and sponsorship to Camerata Ireland’s Young Musicians of the Future. City of Belfast Youth Orchestra (CBYO) and City of Belfast School of Music. All with the objective of supporting their continued studies. Flax Trust Inter-School, Cross Community Choir Competition FISCA bursaries initiated in 2013 continues to involve over 300 pupils from 20 schools in North Belfast Primary and Post Primary. FISCA is bridging the divide through music. In 2015 created shared performance space at Holy Cross Church for the wider community as part of ongoing development and enrichment of diverse musical talent. 2015 The new 76 bed 5 Star Nursing Home for the elderly in North Belfast was officially opened serving the sick elderly of both communities. 2016 – The Flax Trust continues to support The Education Task Group to develop a vision for Catholic Education in North Belfast. The vision is to build an ‘All Faith Education Village’. Having entered the Development Proposal stage which is great news, we await a Government response. 2016 – The Flax Trust funded Houben Centre for Cross Community, personal development, community leadership and inter community understanding has been officially opened. 2016 – In discussions with Argyle Business Centre re development of a Hospitality Training facility for the Shankill area to improve local employment opportunities, the Flax Trust has acquired the site of the Shankill Mission Building to facilitate this project. 2017 – The Flax Trust set-up the ABC Trust, a Community Regeneration Project and transferred the Flax Centre and St Gemma’s School to the new Trust to develop a health and leisure facility.